Only 8 colors make an unlimited number of shades. HASSEN SO-SAI is a powdered color that can dye hair without using oxidizing agents. The hair color with Orange Cosme’s basic concept is “Although we need results, we do not need damage”. 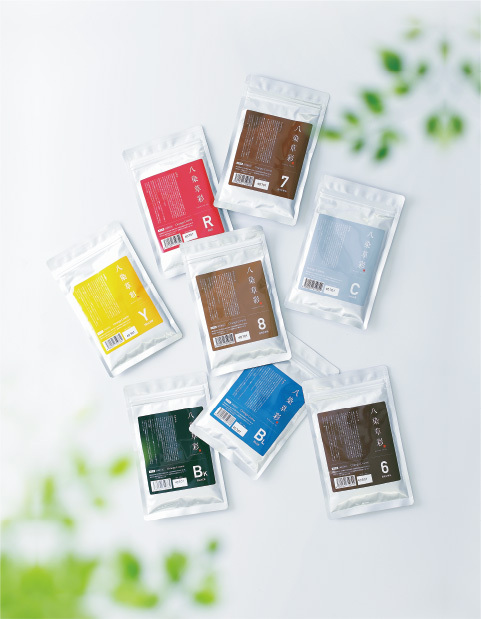 The pure Japanese powdered color “HASSEN SO-SAI eliminates the problems associated with previous powdered color, with features such as good dyeing, good colors, and ease of use. Water-soluble, HASSEN SO-SAI can easily handle gray hair and has a reduced tone treatment that does not turn hair brassy because it needs no oxidizing agent and has an extremely high alkaline content. Apply this water-soluble color after improving hair tone with a lightener when lighter color is desired. 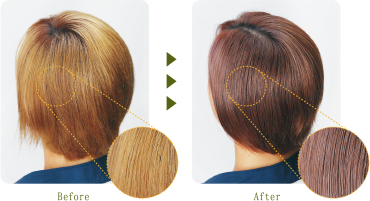 ●Eliminate dissatisfaction with color treatment. Delightful color treatment is possible, cancelling any former dissatisfaction associated with hair coloring such as hair damage, scalp-irritation, and annoying odor etc. due to the fact that extreme alkaline and oxidizing agents are not needed. Uniform easy mixing, easy application, highly controllable. 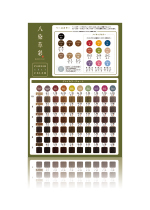 Our powdered colors for salon work shorten coloring time (15 to 20 minutes). Diverse color variations based on mixing 8 basic colors. Although there are basic mixing formulas, each salon can create individual colors with original mixing techniques. Offering a support item, “Lightener” for lighter shades. 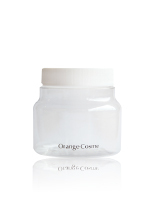 This cosmetic improves tone with minimal damage, which a powder alone cannot do. Powder + Lightener can further expand the range of hair treatment. The effects of Glycyrrhiza extraction have antiallergic and anti-inflammatory action. It protects against not only outbreaks and rough skin, but also moderates dandruff and itching. It has good absorbency and hair penetration action, and has moisturizing and pellicle formation effects. 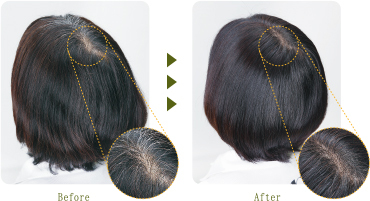 Damage to the hair surface due to chemical treatment is reduced by using firming tannic acid and hydrophobization. Aloe prevents dandruff and itching by keeping the skin clean. It is also highly moisturizing and helps maintain a healthy scalp. Each salon can create original colors as the color mixing is flexible. 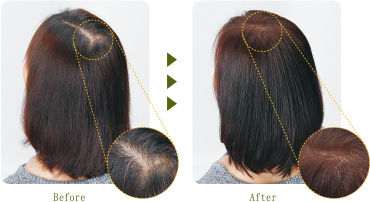 HASSEN SO-SAI (6 brown) and a cream style color (6Lv natural) were used five times to obtain hair strength data on damaged hair (damage level 3~4). With the cream-type color, hair strength was decreased by about 17%, while treatment with HASSEN SO-SAI, strength increased by about 25%. Based on this result, we can say with HASSEN SO-SAI the hair strength is not decreased even when hair coloring is repeated. These photos are the result of a fading test with shampoo and alkaline perming agent. 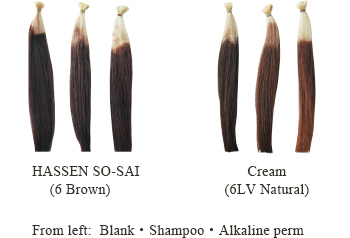 The picture on the left is hair bundle dyed with the HASSEN SO-SAI (6 brown), and that on the right is with the cream type color (6 LV natural). The pictures show the hair bundle dyed with HASSEN SO-SAI has less discoloration with both the shampoo and alkaline perming agents. Support items for treating lightly damaged hair, restricting the balance of alkali Lightener 8~11, 13LV can handle from mid to high tones. It is possible to improve tone to the target brightness despite the fact that the alkali volume is lower than usual when using a ratio of 1:5 with the oxidizing agent. Extract of hypericum perforatum, chamomile extract, linden extract, calendula officinalis flower extract, cornflower extract, Roman chamomile extract. Blended plant extracts with stimulative relief effects. Test data of strength when changing the ratio of lightener and oxidizing agent. Increase in the oxidizing agent can lower the alkali contained in the lightener. As a result, using a 1: 5 ratio rather than 1: 2 is possible to improve tone without causing damage because the strength is not critically decreased from that of blank. Coloring was done with HASSEN SO-SAI to add a shade under the fading color by repeatedly using bleach on color. An original water-soluble powder was used because there was no need to increase the lightness. As a result, the shade was added and uniformly dyed, and the hair itself became uniform and glossy. Because the water- soluble HASSEN SO-SAI cannot increase brightness, brightness was increased with the lightener in advance, then, all the hair was dyed with HASSEN SO-SAI after shampooing. As a result, a bright gray color was formed while aligning the brightness of the newly born sections and the previously dyed sections, and the gloss and elasticity were improved on the whole. 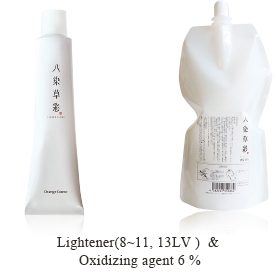 ①Apply HASSEN SO-SAI Lightener 8: oxidizing agent in a 1: 5 ratio to new growth at the root, and leave on for 7 minutes. Water- soluble 6 Brown was applied to all the hair. To any areas with white or gray hair that were easily noticeable, 5 Brown was applied. As a result, white hair was dyed sufficiently and became unnoticeable with elasticity and firmness, giving it a youthful finish. Actually, at first, I also wondered why. However, while using it, I noticed that there are many merits such as the hair color pigment does not cause damage, trauma to the scalp is minimal, the color lasts well, etc. ●Why are the colors good? “The color you are using” and “to prepare just before using” are important. If you compare the labels of other powdered color components, you can clearly notice the difference in pigment. The color used in HASSEN SO-SAI is all in the form of salt. Natural oxidation by moisture and oxygen in the air can be prevented with salt. Furthermore, salt can reduce irritation. ●What is the merit of introducing HASSEN SO-SAI? Hair coloring can be done without causing damage in many cases, especially when touching up roots. Using powder only on the necessary parts can coexist with the good aspects of the existing color. In addition, not using oxidizing agents means no irritation to the scalp, and ammonia and monoethanolamine and such are not used, so there is no noxious odor. Discomfort is, thus, considerably reduced. In addition, the color retention is good. ●Is there anything I need to be careful of when using it? HASSEN SO-SAI is an oxidation hair dye that uses diamine. Discontinue use if a rash develops with diamine. Clothing should be protected from the powder dust, as it may adhere and discoloration can develop. Be as careful as possible when mixing during preparation. Additionally, be careful not to inhale the powder. ●Who are the people (types of hair) it is intended for? It is recommended for anyone who cares about damage due to hair coloring. It is also recommended for hair that has lost its elasticity, flexibility, and gloss due to repeated coloring and aging. ●How many colors are in the lineup of HASSEN SO-SAI? We have 8 colors as the basic color lineup. Combining the 8 basic colors can create over 84 color variations. 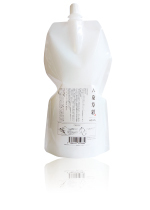 Moreover, additional use is expanded by combinations with a cream style color. 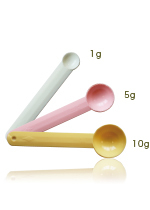 ●What is the difference between HASSEN SO-SAI and the other cream style and powdered colors? Compared to cream color, the big difference is that HASSEN SO-SAI uses water instead of an oxidizing agent. As a result, the damage is lessened, and even if you dye repeatedly, the hair strength is not compromised. Additionally, compared with other powdered colors, it is blended as much as necessary to assure dye with a high-quality pigment. You can understand its stability soon enough by observing its uniform dissolution and its smooth blending. ●Do I have to replace the colors I am currently using? Although frequency of use might increase as you use it, there is no need to unduly replace your currently used colors. You can build-up your usage at first by using its water-solubility to tone down or enhance the color tone of the colors you now use.